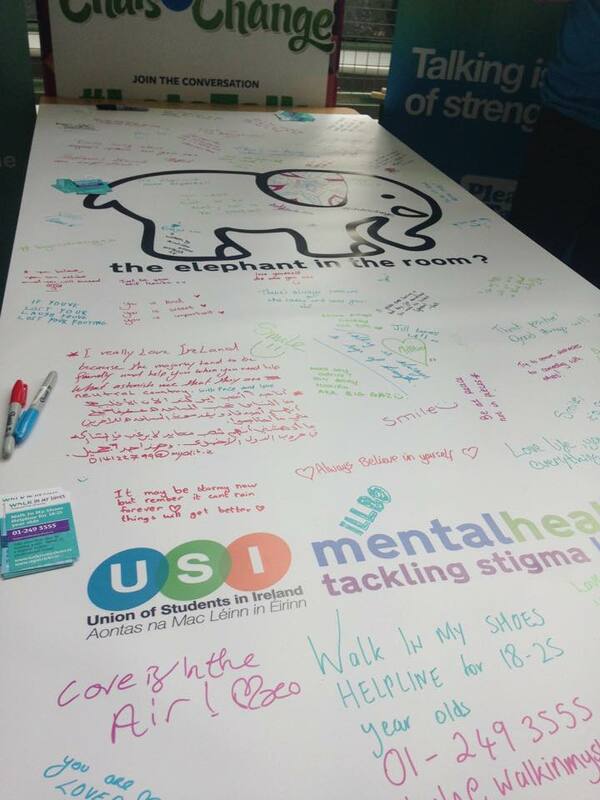 Visit mentalhealth.usi.ie for more information on the work the Union of Students in Ireland is doing on mental health. ChatsForChange is USI’s national campaign in partnership with Please Talk and St Patrick’s Mental Health Services to get Irish students talking about mental health. Mental health is part of all of our stories and it is important we start the conversation and take the time to talk to friends, classmates or family about mental health. Over the last four or so years I’ve attended two different universities, seen three different student counselors, four different college health GPs and two psychiatrists. I have been in the welfare crew in UCD and a Peer Supporter in Trinity. I’m pretty well versed in the supports available to students in Ireland from both sides, and have nothing but the highest praise for all of them. On freshers week and during various orientations we’re bombarded with information about this society and that service which are there to help us as students, but everything’s a bit mental and it’s hard to take in. When you most need the help or someone to talk to it can be surprisingly hard to know where to actually go. To this confusion I have found two solutions. Solution number one: anywhere. Go to any of those outlets and societies advertised to you. If it’s not the right one to deal with your issue then hey, you’ve gone one step in the right direction, and the person on the other end of the phone/email/tastefully decorated counseling room will probably be very kind and advise you on where is best to go. One more phone call later and hey presto(!) you’re in the right place and that bit less wound up and anxious. Solution number two goes something along the lines of get by with a little help from my friends. Seeing every psychoanalyzing specialist in the world wouldn’t have done me a tap of good (unfortunately I cannot quantify a tap) if I hadn’t had the support of various friends, family, siblings and roommates over the last few years. I am a great advocate for professional help where it’s needed, but something as simple as sitting down with a friend and talking out whatever has been eating at me is my number one go-to treatment when I’m feeling crappy. In nursing we talk about continuity of care, and who knows you better than your own friends? Some people have reservations around talking to friends when they’re down or upset because they don’t want to bring their friends down, or burden them or what have you. Please believe me when I say that not only will your friend be happy to hear from you, they might even empathise and express a similar feeling or worry. This kind of confiding is cyclic and contagious and lovely, and leads to everyone feeling better. Every time I have gone to a friend and said something along the lines of ‘here, I’ve not been feeling great lately, do you have a minute to talk’ I have been greeted with nothing less than warmth and comfort. Sometimes I don’t even want a ‘DMC’, but to admit to someone that there’s something on my mind or that I feel crappy is enough to make me feel better. If you do have that feeling of burdening your friends with your worries then worry not! Soon you will be their go-to when they need a hand and so continues the happy cycle of talking out your concerns together. It can be intimidating to start a dialogue with someone when you haven’t had openness with them before, but sometimes all it takes is a chat to change how you feel. 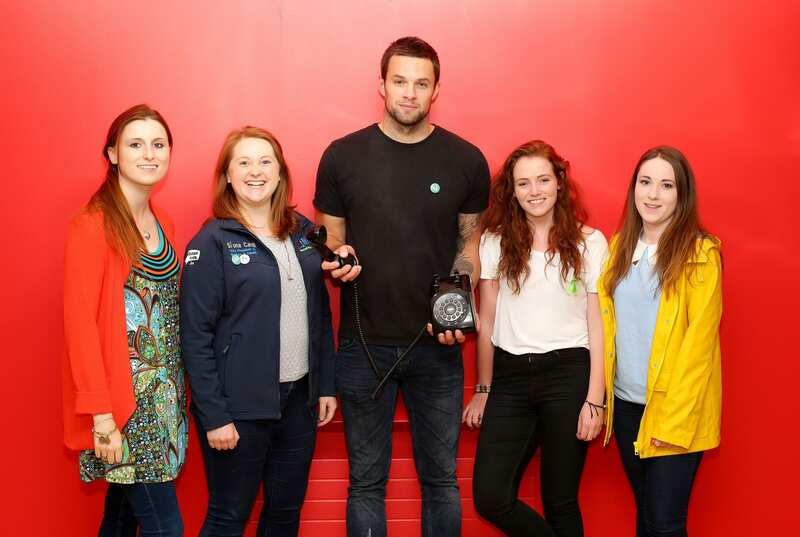 USI have partnered with Please Talk and St Patrick’s Mental Health Services to launch ‘Chats for Change’ to encourage students to enjoy a cup of tea while reaching out and talking to someone. As a nation of tea drinkers and talkers we want to combine the two, we want to encourage students to make time and space to talk about their mental health with a friend, classmate or family member while they enjoy a cup of tea. Call into your local Students’ Union for your free pack! USI will co-ordinate the delivery of the More Talk, More Action Campus Tour. This Campus Tour will visit 4 host colleges and will consist of a collection of events/activities that can take place by a host college in promoting mental health awareness among the student population. Interactive & educational information stands, experts on campus with one on one consultation available, activities and thousands of Chats for Change to be distributed. Talking is a sign of strength, not a weakness. We all have good days and bad, and its okay not to feel okay. No matter what is on your mind reach out and talk to someone, there is always people around you who want to listen and help. Make time to have fun – Every day, take a break from work and study. Do what you enjoy. Whether it’s giving or receiving help – reach out. Start by having a chat with a close friend, perhaps over a cup of tea. If you feeling down or stress or just want to get something off your chest, speak to someone. Have you ever spoke to the college counsellor? Stay connected – Online and off. Call a friend and ask how they’re doing or let them know if you’re not feeling good. My name is Evan and I am 23 years of age. I have recently graduated from UCD where I studied Science. Like so many Irish people in their teens I loved sports but after a slew of injuries and one pretty serious health scare I was told I would no longer be able to take part in competitive team sports. This was a bit of a hit I have to admit, I had only just started getting into rugby and I had been looking forward to playing in university. I was going into a new environment and I thought it was going to be that much harder to meet people without having that stalwart and almost guaranteed team camaraderie to rely on to make new friends. However I got lucky with Science (my second choice on the CAO). It is genuinely a great school to be a part of, not too big like Arts where an individual can get lost in the crowd but large enough that there is always something going on. My first year was pretty quiet; I got a new girlfriend and became part of a really great close knit group of friends. It was a great way to start off college especially considering how tough and lonely university life can be for some. However, I was still missing that unique feeling you get from being part of a team; the feeling of working with a group of people who all want the same thing and are all trying their best to achieve it. From the start of second year I started to get involved in welfare driven campaigns on campus because I thought I understood how things like depression and mental stress can affect people and for the most part I had managed to avoid any serious problems of my own and wanted to help. My interest was particularly drawn by the Please Talk campaign. Please Talk is a student and staff run suicide awareness and prevention campaign run in third level institutions throughout Ireland. I had loss people to suicide before and had seen the affect it had on those close to me. I discussed my interest in the campaign with the Welfare officer of the time and he invited me to be on the committee. I learnt a lot more about Please Talk from those first few meetings. 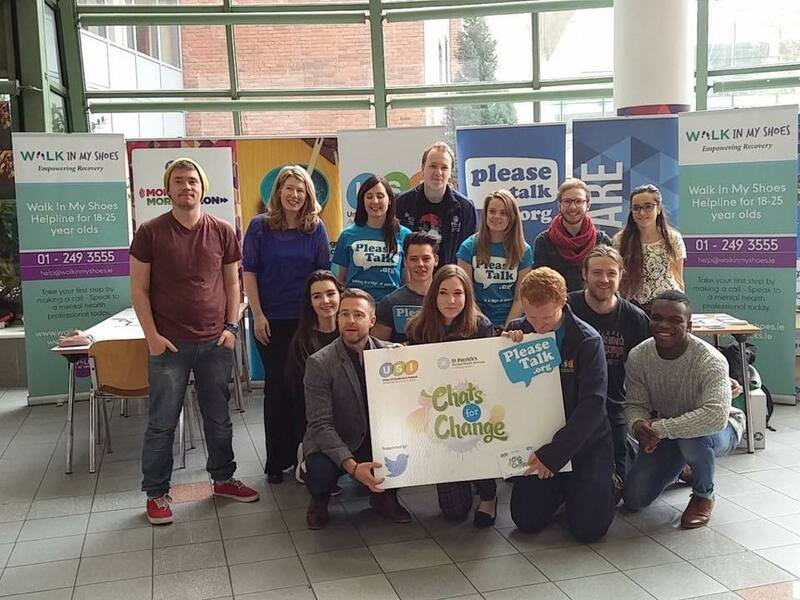 The campaign was founded in UCD after a number of student deaths from suicide. It was the coming together of students and faculty as a community and the realisation that something had to be done to stop tragedies such as these from happening again. People needed to understand that it is a good thing to talk about their problems, to let whatever may be bothering them go and except help from others. From this idea sparked a simple message; “Please talk”. In Ireland we have an almost embedded embarrassment about talking about our feelings, a dogmatic sense of not wanting to bother anyone else with our troubles even those who care about us the most. It’s almost as if we fear that we would be standing out of the crowd by admitting something’s wrong. 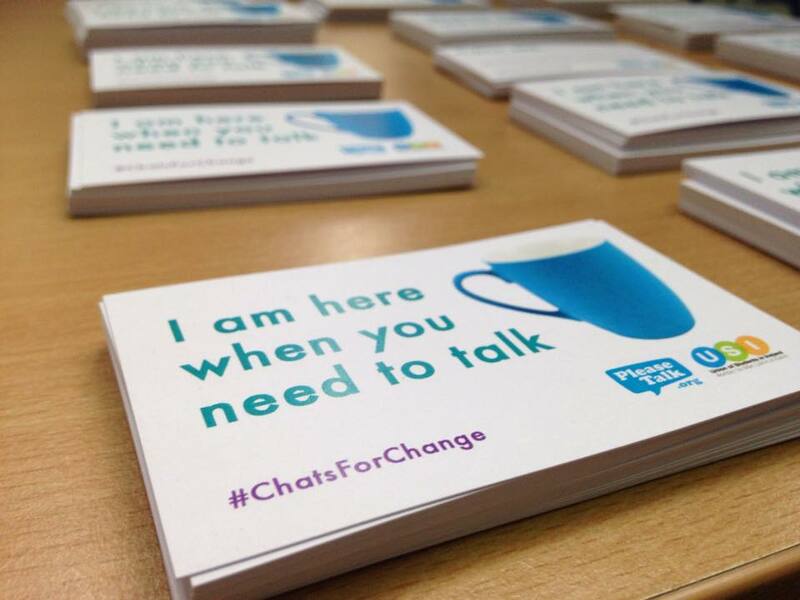 However my time working with campaigns such as See change and Please Talk really began to teach me that no one is excluded from having mental health problems, we all have bad days and by far the best way to deal with them is to open up to someone and talk to them about it. I found working on these campaigns to be endlessly rewarding. The more I got involved, the more I learnt and although I still missed running around with a ball I had a new team now and I never felt better (as lame as that sounds). The mental health of a person is paramount to their continued well being. People are not just meat and bone; we need more than just food and water to survive. As cheesy as it sounds people need other people. When I think about it I always think of the John Donne quote, “No man is an island”. We need to look after each other and make sure no one is left behind. Friends, family even professionals like student counsellors are part of our team. They’re the ones that are there to back us up when we’re in trouble and that’s what campaigns like “Chats for Change” are all about; they encourage us to support each other, to be open about our problems and allow others to help.